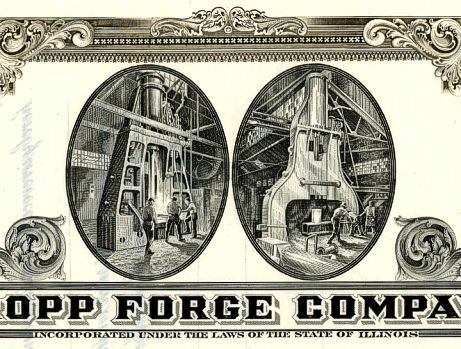 Beautiful certificate from the Kropp Forge Company issued in 1946. 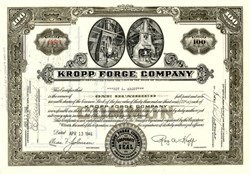 This historic document was printed by Northern Banknote Company and has an ornate border around it with a vignette of machines inside of the Kropp Forge Company. This item has the signatures of the Company's President, Roy A. Kropp and Secretary and is over 62 years old. The certificate was issued to Roy A. Kropp. Excellent condition. Kropp Forge is named after Charles A. Kropp who came to America in the late 1880's from Sweden. After working at an area forge shop, he and three others opened a small flat die forge shop in Chicago in 1901. Prior to World War I, Charles Kropp became sole owner of the company and later moved the company to its present location in 1918 in Cicero, IL. At that time the plant's primary focus was products for armaments. Over the years, the company's product line grew to include to include parts for the Railroad, Oil, Agriculture, Automotive, Machine Tool, Marine, Construction, Power, Material Handling and the Aviation Industries. World War II brought a further increase in production for Planes, Ordnance, Ships Military Vehicles and Essential Machinery. The Kropp Family sold the business in the late 1970's, and the company changed hands twice more in the 1980's until being purchased by TIC United Corp. in 1987. The company weathered difficult times in the late 1980's and early 1990's with labor problems and general business decline which forced 25% of the forging industry to close their doors. Kropp Forge has survived these difficult times and, since 1993, Kropp has been growing with steady increases in sales, employment, capital reinvestment and most importantly, customer satisfaction.